TheDemon chimes in regarding Pangaea's dominion push, and uses the dominion situation as an argument in favor of drawing borders and calling a temporary ceasefire. Lanka's army has backed away from the border, and it appears that the combined arguments of three fellow players have motivated our armies to move from the Lankan border to the Pangaean front. We're also forging a second jade knife (even though the first one isn't in use yet); even without the use of any jade knives our dominion has stopped giving so much ground this turn. Nothing else is going on, really. Another Dark Knowledge cast turns up no new Death sites, and of course Delgnat is sent out to die again. The research is all pretty much explicitly for remote site searching spells. Evocation gets us Arcane Probing and Thaumaturgy x2 gets us Haruspex (among others). The Dark Knowledge cast turned up nothing, and the battle was a scouting report of a battle between Hinnom and Lanka. The event was a free lab in the province where we moved our huge army last turn. All that being said, I guess there was diplomacy going on in IRC after all. As you can see below, our big army turned right back around! Dominion loss is still a problem, in fact, but presumably buildscharacter convinced Dawkish and/or Xanrick to get back in the fight against TheDemon and so the army rerouts again. That's odd, I don't see Delgnat marching off to her death this turn. Actually, I don't see her anywhere. 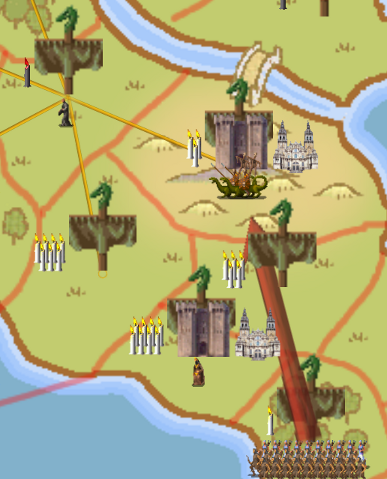 Uh... that province in the upper left corner of the screenshot had two friendly candles last turn. It's where Delgnat was headed. Now it has one of Hinnom's candles and Delgnat is gone. Apparently homesickness calculates after dominion spread, which means that Hinnom pushed his dominion into my province and then Delgnat died of homesickness in unfriendly dominion, and therefore could not come back. And just like that, she's gone forever. An excellent hero dies as uselessly and anticlimactically as I feared. You owe me a hero, buildscharacter! Or at least an air mage. 1. Control the entire isthmus (Lilli has one province on it so presumably I'll have to take it from her). 2. Extract an air mage from buildscharacter (or enough gems or sites to summon or empower an air mage for myself). This turn is so dull it doesn't even deserve any screenshots from me. Also, I'm still annoyed about Delgnat. We got Thaumaturgy 3 research which is pretty useless. Dagan actually found a site manually in the province where Delgnat died: an Enchanted Gate (1 Astral pearl per turn). A random event gave us a few Air gems. The Archers in White mercenary group left us. Oh, also we're moving an army of 130 troops, 5 Witch Kings, and our prophet north across the bridge into Lankan territory. Don't worry about the archers, though. There are 110 of them in 4 squads, each of which is scripted to Fire Closest. The Witch Kings are all spamming Raise Skeletons. Nothing could possibly go wrong.